Teaching Blog: Discussion Practice – Who Gives Way? Picture the scene. You are walking on the pavement when you notice there is somebody coming towards you. If one of you does not move, you will bump into each other. There is room on your left (and their right) for somebody to move to (see picture above). But who moves? Do you move for the other person? Why? Do you keep going and when they also refuse to move you stop and wait for them to walk around you – if, in fact, they do? Do you keep your course and try to force them to move? This is a fairly light-hearted discussion-based lesson about status, empathy for people we don’t know, etiquette, and personal prejudices. How often do you walk around your town? Are you a confident walker or a nervous walker? How often do you face the situation mentioned above during a normal walk? What do you tend to do? Do you keep walking, stop, or give way? Why? What factors influence your decision? For example: type of person, their appearance, their activity (what they are doing), and the kind of path you are on? Have you ever been involved in an awkward ‘dance’ with somebody walking towards you, because both of you try to move out of the way in the same direction at the same time – and you keep doing it until one person finally stops? Have you ever had an argument with somebody who bumped into you, or who wouldn’t get out of your way? What happened? How did you resolve it? In that kind of situation SS could pick other cards to replace the absurd element(s). SS could talk about what happens if you swap around factors, e.g. swap the places in scenario one and three. SS could add ‘conditions’ (e.g. weather: too hot, too cold; raining, etc.) and ‘time’ (e.g. early morning, 11pm, etc.) to each scenario using the blank cards. 3. When SS have discussed 4, 6, or 8 different people and situations, they pick two of them and decide what would happen if those two people met on a path. SS discuss which factors are stronger and weaker. Which person trumps the other person in terms of not having to move out of the way? Why? 4. SS look at a number of different factors in an imaginary person coming towards you and rank them from strongest (you definitely have to move) to weakest (the other person definitely has to move.) SS should justify their reasons. Which factors are dead certs meaning you would have to move, e.g. young people may feel they have to move when faced with an elderly person coming towards them, while somebody else may decide they will not move when a cyclist is coming towards them, since the onus is on the person who is moving fastest to exercise move care. A man may decide that he must always move for a woman, and so on. Which single factor is the strongest? This could lead into a whole group discussion. As a twist, SS could discuss different scenarios when walking behind one or more person and trying to get past them – e.g. trying to pass a family group with a pushchair, dog, etc. 5. SS create and write a dialogue based on one or more of the scenarios and act it out for the rest of the group. Some of the combinations may well suggest dramatic scenes, for example: ‘an ugly boy pushing an empty shopping trolley down a hospital corridor…’ could suggest a heart-breaking situation. 8. SS write an essay about the little-discussed ethics of walking around in public without bumping into each other. How has this lesson related to their lives and touched on their habits and prejudices? What will they take away from it? What will they do differently as a result of studying this discussion topic? Why? If nothing, why not? 9. SS stand in a group in the middle of the classroom; T (teacher) says a factor; SS move to one or other side of the class to vote for either ‘move’ or ‘keep going’. T has the definitive answer for each factor. SS who are wrong go out and sit down and the game continues until one person wins. I hope you will enjoy using this original lesson plan from PurlandTraining.com! If you do use it, please let me know how it goes by contacting me (Matt Purland) here, or leave a comment below! This entry was posted in creative writing, Discussion, EFL, ELT, English, ESL, ESOL, Free, Group Work, Lesson Plans, Listening, Pair Work, Printable, Speaking, Teacher Training, Teaching, Teaching Blog, Vocabulary, Worksheets and tagged discussion, group work, listening, pair work, practice, scenarios, situations, speaking, talk on June 4, 2018 by admin. 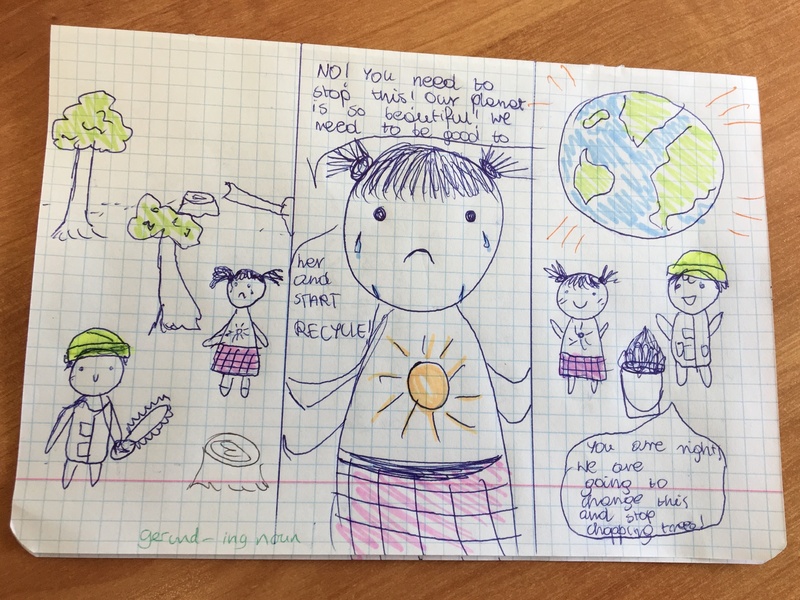 Teaching Blog: How do you Escape from a Desert Island? Well, that was the setup for the lesson! (They didn’t really crash-land in the Pacific Ocean. If they had, I’m sure our lessons would have been cancelled.) This was my take on the classic team-building problem-solving game. I set the scene in as dramatic a way as possible (involving plane noises, explosions, and swooping hand gestures), then outlined the task, as above. I gave each group a laminated page with the items on (see above). We checked they knew what they all were and the name of each item. I explained that their basic aims were: FIRST – escape from the island; SECOND – survive. SS (students) were allowed to use dictionaries and phone translators, as usual. After the register and setup (10 mins), and preparation time (15 mins), it was time for the presentations (20 mins). Each group went to the front and presented their choices and their story. I asked questions, e.g. ‘Why this?’ / ‘Why not that?’ and so on. I asked SS about unusual items they had chosen, e.g. the mobile phone or the chocolate, which were both not popular choices. I also asked about life on the island: ‘Have you met any other people on the Island? Can you describe what you can see? How do you feel? What happens…?’ and so on. SS could add drawings and sound effects, if there is time. Role play key moments in the story. Make and edit a film with phone video recorders. Create a competitive version where you assign a value to each item – from low to high – and SS get points for their choices. The ones with the most points win. This would need a rejig of items to make it more difficult – more useful items and fewer low-value items. There is lots of scope for using creative skills. The lesson could easily have lasted 90 minutes. SS write up a diary with x entries, e.g. Day 1, Day 2, Day 8, and Day X (the day their story comes to a head). It was another topic that engaged the SS from the outset, and a fairly simple activity compared with previous presentation tasks. The lesson plan worked like a charm and the planning and preparation time that I put in at the weekend paid off big-time. The lesson time flew by but it was really important to keep strict timing so that we could hear everybody’s presentation. On a couple of occasions we ran out of time and I had to hear the last presentation during the break-time. It was a manageable task with an interesting theme that allowed for SS’s use of imagination, for example, one group imagined ‘cannibals’, another an island full of women, while one student wanted to cut the twelve plastic bottles in half and hang them upside down to (somehow) collect the moisture from the air. It was a nice easy class for me to manage. I did the introduction, then SS worked in pairs or threes and I could monitor casually; then we had the presentations; then the lesson was over. I could use the Q&A element as a filler by asking more questions, or ask fewer questions, depending on how the time was going. So, if there were still ten minutes of lesson to go but only two more presentations, I would ask both groups more questions to fill the time. We had fun with the Polish word for axe, which is siekiera, and pronounced almost the same as the name of the popular singer Shakira. It was interesting to see what each group had chosen, and what they valued. I was surprised that the water was so popular, because it could only be used once. There were only six litres, so a three-strong team would only get two litres each. Still, many groups valued it above items such as the tent, and thought they would get some use out of the plastic bottles too (as above), e.g. as containers; for catching fish/insects; for making a raft with floats, and so on. We had a few discussions about boiling seawater. I didn’t think it was possible and it forced me to look it up online and discover that it would be possible to distil it by boiling it and collecting the condensation. However, I don’t think the SS had the right tools to be able to do this – pans, glasses, cups, and so on. Still, it was a moot point! However, this lesson provided a breakthrough in terms of the problem of getting the SS to speak English during the lessons. As I got used to doing the lesson plan (13 times over the course of one week!) I realised that the longer I sat with the groups while they were preparing, the more they would have to speak English; also, the longer time I allowed for presentations, the longer I could do the Q&A sessions, where again SS had to speak to me in English. As the lessons went on I allowed less time for setup and prep and much longer for the presentations. This really felt like a significant breakthrough, and it is something I will do again in the future. If I did this lesson plan again, I would definitely rethink the items. 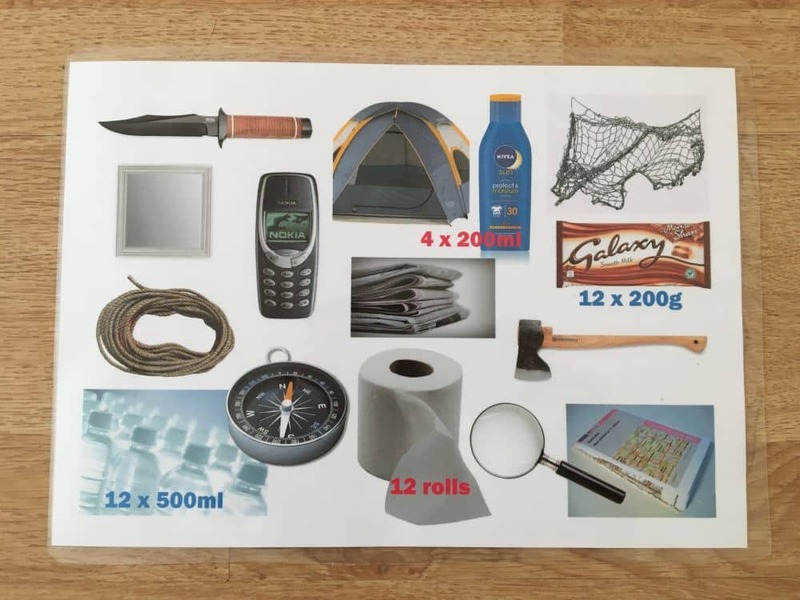 There are too many ‘weak’ items, like the chocolate, the sun lotion, the toilet paper, the newspapers, and the mobile phone, so many groups ended up choosing more or less the same six most useful items, i.e. the knife, axe, net, rope, magnifying glass, and water. There need to be mainly strong items to choose from, so there is more variety and more deliberation/explaining to do. That’s something to improve the activity for next time, but it didn’t spoil the lessons. Early on I realised I had to explain what some of the items were. The mirror was mistaken for a frame a few times, and one group thought the newspapers were towels! In the initial lessons, SS read out short stories, with a list of items usually at the beginning. I decided to ask them questions to try to break up the prepared answers and get some spontaneous answers. This ended up working really well. There is a gap in the narrative / break in the logic, which none of the SS mentioned or seemed bothered about: why, if the washed-up container had fifteen items in it, did they have to choose only six. The task relies on selection, but why only six things from fifteen?! Nobody asked! Why were these fifteen items together in the container anyway? I remembered the mnemonic: KISS (keep it simple, stupid!). But it began to bother me. I didn’t find a suitable narrative. It would have to be that another person – from the plane or from the island – was limiting the number of items to six. Thankfully it didn’t matter! The SS accepted the activity for what it was and ran with it. Overall this week’s lessons were really fun. Being able to do this lesson plan with thirteen of my eighteen groups was really rewarding. The lesson plan was solid but it definitely improved as we went along, and can be improved in the future. As a postscript, during one of the final lessons with this plan I finally realised that the term ‘desert island’ might have given all the groups the wrong impression! In Polish ‘desert’ is pustynia – like the Sahara Desert – while deserted is ‘opustoszały’ (abandoned/desolate). 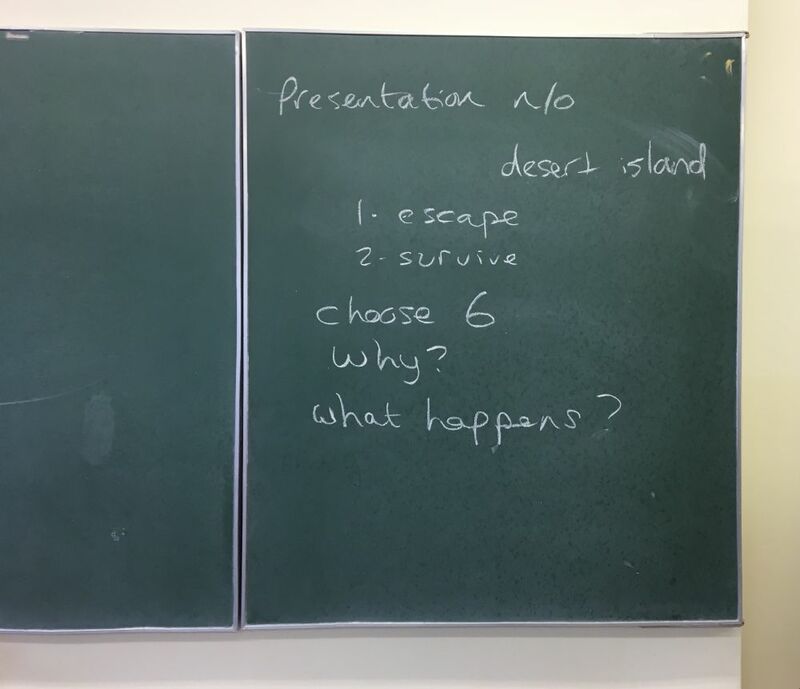 One student asked me in the penultimate lesson – ‘Is the island just desert?’ ‘No,’ I explained. ‘Desert island really means deserted island. The island can be big, with trees and lakes. It’s up to you. It’s about your imagination!’ I could have kicked myself: how I had potentially made it harder and more confusing for them because of the language barrier, and by assuming they know what the cultural concept of a ‘desert island’ is. What I had in my head was apparently completely different to what they might have been imagining. More planning required! 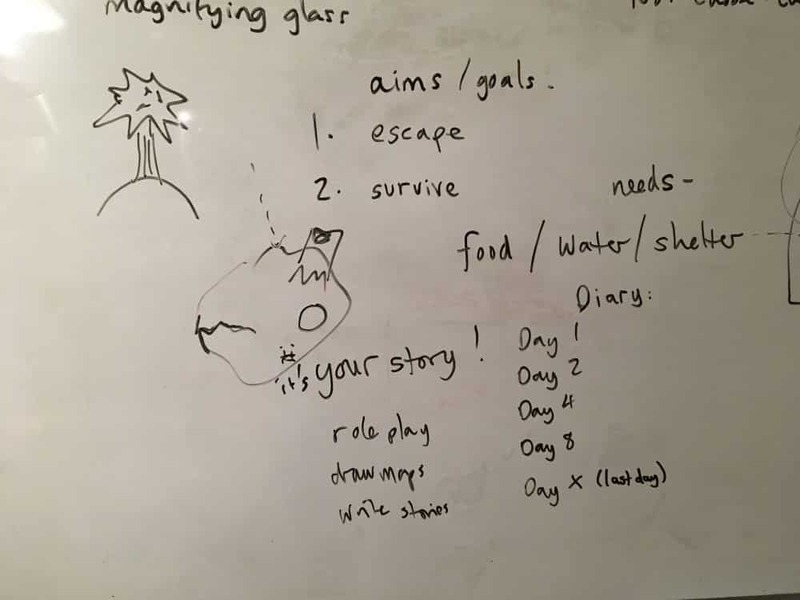 This entry was posted in EFL, ELT, English, ESL, ESOL, Group Work, Lesson Plans, Listening, Pair Work, Presentations, role play, Speaking, Teacher Training, Teaching, Teaching Blog, Vocabulary and tagged desert island, group work, imagination, listening, pair work, presentation, speaking on May 22, 2018 by admin. Teaching Blog: What’s in my Bucket? What’s in my bucket? These ten everyday items! This week I based some of my lessons on the game called ‘What’s In The Bag…?’ (Click here.) I adapted this rather simple idea to make it into a competitive team game that could fill a 45-minute lesson. I had been thinking about doing this activity with my students for a while, but earlier in the week I had impulsively bought a large blue plastic bucket for garden use (clippings and so on) and it occurred to me that this would be the ideal receptacle for this game. So it became ‘What’s in my bucket?’ rather than ‘What’s in my bag?’ There had to be a way to keep the contents of the bucket secret as students dipped their hands in, so I covered it with a 120l bin bag (see picture above). As SS entered the class they could see ‘What’s in my bucket?’ on the board and the large bucket in a big blue bin bag standing on a table in the middle of the room. SS became a tiny bit interested in what the lesson was going to be. After doing the register, I asked SS to work in groups of 3 (or 4 if necessary). The aim was to have 4 or 5 groups max. in each class. SS thought of a team name and I wrote them on the board. This was a fun way to identify the teams. Rather than ‘Team 1’, ‘Team 2’, etc. we had ‘Racing Team’ or ‘Damek’s Carrots’! Warmer: I asked them straight out: ‘What’s in my bucket?’ SS had to guess cold, without feeling inside the bucket. If anybody had been able to guess cold they would have scored points. Again, the aim was to arouse interest in the activity – and, if I’m being honest, pad out the lesson content a bit. SS wrote items that they had identified on the board (under their team name – see picture below) – in English. (SS were allowed to use dictionaries and the internet to check words they didn’t know.) If one team had guessed an item, another team couldn’t claim the same item. SS had to be fairly specific, so for example in the case of the toy polar bear the word ‘TOY’ or ‘ANIMAL’ was not accepted by me, while ‘PLASTIC BEAR’ was. With higher-level groups I made them be even more specific: ‘Yes, it’s a battery, but what kind?’ SS feels in the bucket again: ‘AAA?’ ‘Yes, that’s right! But what colour is it?’ Seriously, you could give bonus points for correct guesses to questions like this. Each group had a turn. After one round there were several items written on the board, under various team names. I said which were correct. After the second round (60 seconds each) the SS had maybe been able to correctly guess seven or eight items between them. Time-permitting we played a third and final time, but with only 30 seconds per group. If at the end they hadn’t guessed all ten items I gave clues and tried to elicit what they were until the SS guessed them. Or just told them, if we were in a hurry. With a few groups I helped them by removing the guessed items one by one (and eliciting their names from the whole class) to leave the last two or three items, making them easier to identify. If you have time, you could ask SS to pick some items to put in the bucket for you to guess. Of course, don’t look when they are doing this! One of my classes did this and I had to guess the items, but I felt it was a bit boring for the SS and the focus was all on me, which I wanted to discourage. It was really interesting that the hardest part of the game for the SS was not guessing the items, but finding the correct name for those everyday things. I had chosen things that we see around the home all the time, but don’t necessarily know in the target language (English). One example was the word ‘coaster’. In Polish this is ‘podstawka’ which basically means ‘stand’. In Polish this single word can mean one of half a dozen or more different items, so the SS came up with various names when they felt this item: ‘tea tablet’, ‘tea pad’, ‘tea stand’, ‘tea saucer’, ‘tea tray’… all of these words are served by the same word ‘podstawka’, while in English we have many different words, including ‘coaster’. It was really nice to see teamwork within the groups of three. Most of them naturally – without being told by me – adopted the dynamic of one feeling and speaking, one checking the translation, and one writing on the board. pulling the ring pull off the can of sweetcorn, then near the end of the lesson, when they felt hungry, trying to open the can by smashing it on the corner of a desk. They now owe me one can of sweetcorn! And yet this class were still able to guess six out of ten of the items. In hindsight, should I have played this game with them? In terms of the language goals it’s debatable how much English the SS learned from doing this activity. 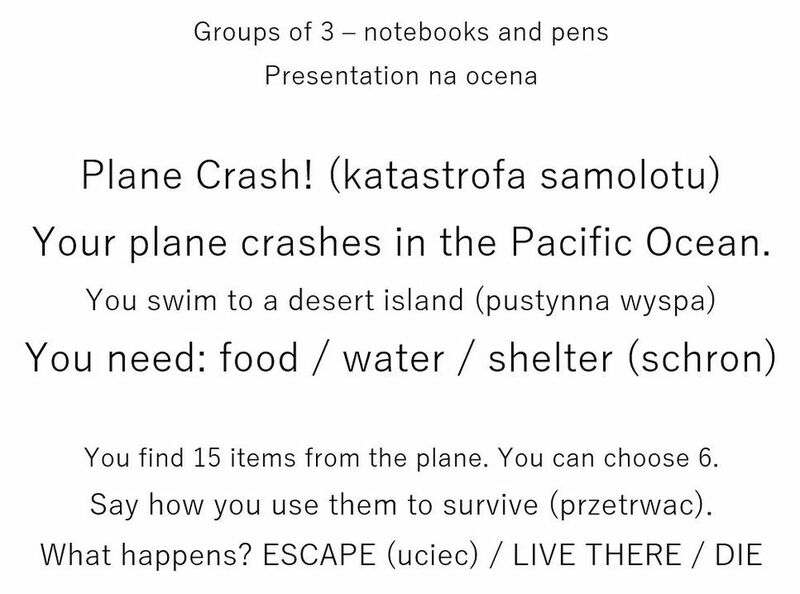 It wasn’t really a communicative activity and SS used Polish throughout, apart from to say/write the names of the items. There was no presentation element, unlike the previous few weeks’ lessons. However, it was undoubtedly fun for each group. Next week we will have to work harder on speaking in class. This entry was posted in Drama, EFL, ELT, English, ESL, ESOL, Free, Games, Group Work, Learning, Lesson Plans, Lessons, Teacher Training, Teaching, Teaching Blog, Vocabulary and tagged fun, game, goals, language, teaching on May 14, 2018 by admin. Warmer 1: Follow the Clap. After taking the register T randomly starts clapping slowly, then encourages SS to join in: ‘Clap with me!’ Then varies the speed – slower or faster. 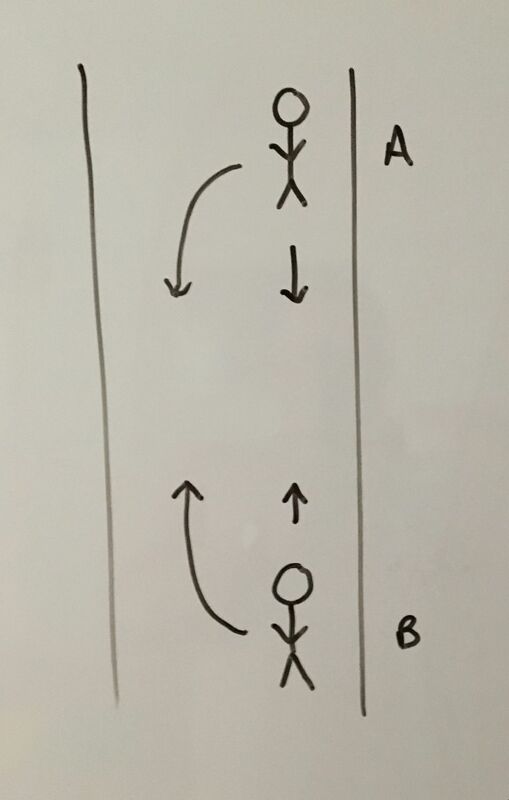 When everybody is clapping in time, T varies the timing and SS have to try to follow the clap. Then clap in time, then vary the timing and/or speed, etc. T asks: ‘What’s the point of doing this?’ SS: ‘To get us to focus’, ‘To get us to listen/watch’, ‘To get us to follow’. Let different SS lead the clap. SS give their answers in order. T can have short conversations. SS work in pairs. Tell them you are going to give each pair $1,200 (or in local currency). Put the instructions on the board (see image above). Run through the instructions; ensure everybody understands what they have to do; stress the aim is to hear a spoken presentation from each pair by the end of the lesson. It was a good opening gambit. SS were immediately interested when I said I was going to give each pair 4000 zl (Zloty) in cash! However, only one pair bought me a present! (A trip to Sydney, Australia.) I chose 4000 zl because it’s a good amount of money, but not a ridiculous amount – like five million pounds. You could give a different amount. Stress that SS have to spend all of the money (to the last penny) and that they can’t invest it. One pair wanted to invest all of their money in Bitcoin. It was a nice challenge for SS to work in pairs and get the presentation ready in around 15 minutes, then present it. 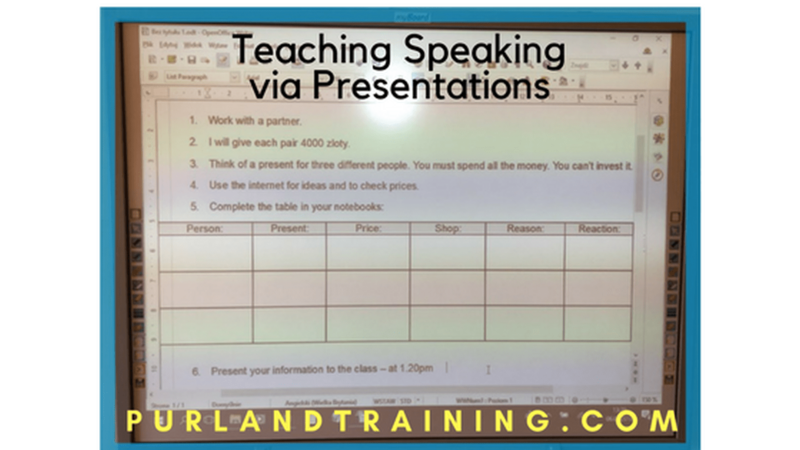 I repeated this lesson several times during the week with different groups and towards the end of the week I cut one then both of the warmers to allow more time for preparation and presentations. It was a good ‘clockwork toy’ activity – set it up and watch them go! There was a good positive hum of activity from SS during the preparation stage. I allowed them to research prices online – on laptops and mobile phones. All SS were engaged. It was a relevant and motivating task. There was a nice element of wish-fulfilment for the SS – choosing presents with somebody else’s money. Following on from last week’s lesson about the weather, I aimed to get them to use more English in the classroom, rather than L1 (Polish). I asked two of the higher-level groups to try to speak only in English during the prep stage as well as during the presentations. 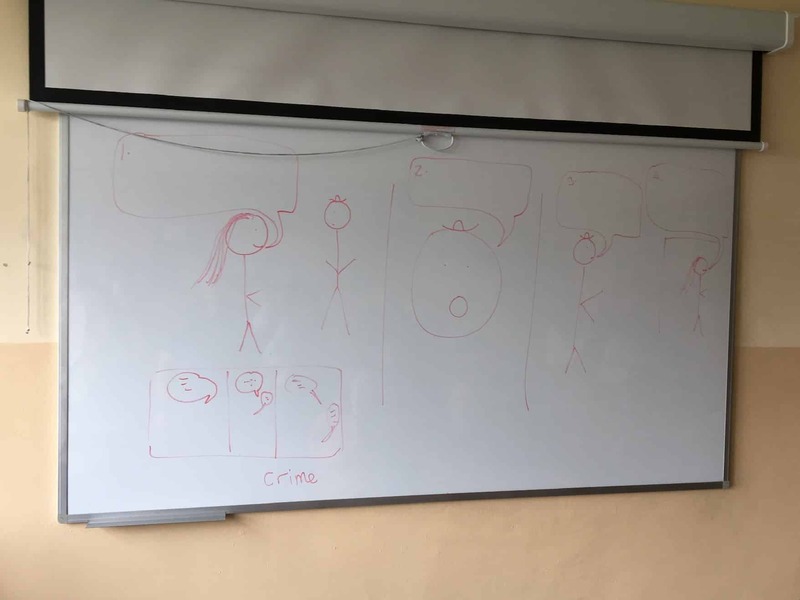 I monitored this and when I heard them doing it, it really felt like I was doing my job properly for the first time – getting them talking in English during the lesson. My challenge is to roll this out to all other groups, as far as possible, over the next few days and weeks. After last week I aimed to use the same model, and it worked again: warmer -> pair research on PCs or mobile -> presentations. SS not listening to each other during the presentations. This is more of a behaviour issue. I’m thinking about how to improve this. SS giggling when presenting their work. For some it meant a lower mark. I hope the novelty of having to give presentations will wear off, and this be much less of a problem. The biggest issue is that time is always against us. The lesson has to be delivered and done in about forty minutes. All feedback has to be given in those forty minutes too. Timing is so important. Next week there will be a new lesson to deal with. The bell rings and the SS rush off to think about another subject with another teacher. If we had an hour or ninety minutes we could have more time for preparation and time to address issues of sentence forms, numbers, and listening to one another… I wondered whether I should devote two weeks to one topic, but by next week the SS will have probably forgotten what we did. It’s the transferable skills that we can work on week-in, week-out – via different topics: working together, researching and preparing information, speaking in public, and listening to other people. This entry was posted in ELT, English, ESOL, Group Work, Ideas, Pair Work, Speaking, Teacher Training, Teaching, Teaching Blog, Warmers and tagged choosing presents, English, ESOL, free, learning, numbers, pair work, presentations, prices, research, teaching, teaching blog, technology on April 9, 2018 by admin.